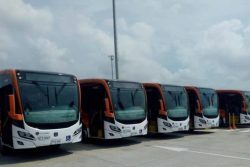 Transcaribe in the Colombian City of Cartagena has added 131 new Compressed Natural Gas (CNG) buses to its fleet. Of the 131 buses, 32 are dual articulated (doors on both sides of the body), with capacity for 140 passengers each; 69 are standards, with capacity for 90 people; and 30 are ‘busetons’ (feeder buses) capable of carrying 50 passengers per vehicle. The new buses represent an investment of 110,000 million pesos (approximately USD 35.3 million). The new bus fleet complies with the Euro 6 standard, which makes it the most modern in Latin America, since these natural gas buses meet international standards for gas emission control. Its engines reduce emissions by up to 98%. With the new fleet, the service will be improved throughout the system and 350 direct jobs will be created, among new drivers, administrative and operations personnel. At present the Cartagena people make 140 thousand trips a day in the Transcaribe system.